Somewhat unsurprisingly, the weekend fixtures slowed down in scoring and multiple underdogs came away with wins. The biggest was Wolves, who scored three straight after Harry Kane found the back of the net once again. It was an interesting gameweek, but as long as you didn't stretch too much for your captain, you likely had success because Liverpool still managed five goals and Man United are the best team in the league again. The biggest questions for Gameweek 21 will be which players get rested because none of the major names were on the bench over the weekend. And while there are FA Cup fixtures this weekend, it's expected that's when players will be rested. There are a few places to look for captaincy, with Arsenal (v. Fulham) and Chelsea (v. Southampton) the best bets. Pierre-Emerick Aubameyang didn't do anything against Liverpool, but he returns home against a side that has allowed 24 away goals this season, the most in the league. Plus, Aubameyang has been dynamite at home with four goals and two assists in his last three tries, and he scored a brace off the bench in the 5-1 October win. Eden Hazard hasn't been as easy to trust of late, but he also faces a back line that hasn't stopped anyone, and Southampton have already had major issues stopping top teams on the road; not to mention, Chelsea won the first meeting 3-0. A clean sheet is in the cards if you're still a Marcos Alonso fan, but it'd be hard to give the armband to a defender over top scorers in good situations. Kane has to be in the mix after making the scoresheet in six consecutive starts. Cardiff are playing well and haven't allowed a goal in their last two, but they also haven't played an attack like Tottenham's. Son Heung-Min is still available for Spurs, and he's been better than Kane with four goals and two assists in the last three matches. But as seen in their last match, Spurs can either be awesome or a complete bust, so that's definitely a worry. Manchester United are also on the road and face a Newcastle team that's been all over the place, but it's worth noting United scored three goals in the previous meeting and that was with Jose Mourinho. 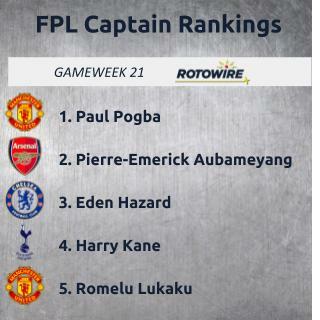 Paul Pogba was my top captain last week and there's no reason to change that. Without Mourinho, the Frenchman has become what every United fan expected, with four goals and three assists in the last three matches. Marcus Rashford is next in the conversation if you don't have Pogba, but he's still further behind with two goals and one assist. That said, Romelu Lukaku could easily enter the starting XI and turn into the star he became at Everton when he had 25 goals in the 2016/17 campaign. Even though Lukaku may not be a popular captain, he could easily score multiple goals. Manchester City and Liverpool are in a huge match, but there's no telling how this game will play out. City's back line has been sketchy and Mohamed Salah has been great, but giving the Egyptian the armband in this spot is difficult considering the prior meeting went scoreless. The same goes for anyone on City because it's not only a difficult matchup, but it's always a mystery as to where the scoring will come from. It's a tough week for differentials since none of the matchups stand out. West Ham look to have the most favorable one, but Brighton have held Arsenal and Everton to one goal total in the last two. Marko Arnautovic did little against Burnley in his return from injury, but he still has to be in the picture, with Robert Snodgrass more likely to pick up an assist. Everton hosting Leicester features a few players who have been captain worthy at times, but I've found it's best to avoid any match that Leicester are involved in. Only two teams have scored more than one goal in Leicester's last six league matches. That's the main reason I'm also tentative on backing Wolves against Crystal Palace because that has all the makings of a 1-0 result (Wolves won 1-0 in October and three of Palace's last four matches have had one or zero goals). If you're a Wolves fan, Raul Jimenez makes the most sense, as he's consistently been their top attacking option with six goals and four assists. Callum Wilson would be a clever place to look for the armband mostly because no one else will be considering Bournemouth after their rough run of results. But the Cherries have struggled against top clubs all season while feasting on the weaker ones, as seen in their 4-0 win at Watford in the first meeting.